I'm all about trying to stretch my interests out as far as playing with my cards and off what I'd started last year, there has been a push towards trying to see where specific cards off my awesome can be jammed together - for the longest time, my awesome action collection was a mashup of assorted cards, but maybe I've been influenced by other cards bloggers to get even more specific as far as pooling together cards that show similar, unique images. I added a column to the Google Sheets file where I could 'tag' listed cards I had in-hand according to a classification - I might have around 1,000 cards listed in my main awesome action collection and so I don't get overwhelmed, I'm only grabbing a certain number of cards at a time [like all the cards of players with the last names A-B, B-C, etc] to get through the year. To dig a little deeper perhaps, I added a grouping column where I want to label cards within the main awesome action subset and classification - so far, I only have my A-B cards off my main collection and awesome action cards I had in my temporary setups to classify. I’ve tried to conjure up groupings that come up as I’ve played and listed out cards in a specific classification - as is, it was a little confusing to sort what I had all over again, going in different directions, trying to herd into one place, that might fit better in another place, etc. I worry the names of the groupings sound too basic, where there isn’t really have a ‘bite,’ but the cards that are tagged under an occasional boring sounding grouping - were collected within the awesome action umbrella. Actual on field game action – baserunning, batters bunting, batting, celebrations, confrontations, curtain calls, fielding, in the air, making the throws and pitching. Unique perspectives - angles, event captured, horizontal, interviews, lounging around, majestic / panoramic, multiple-exposure manipulation, posed photo shoots and signage. Maybe by the end of the week, things got more clear cut - where I was able to organize by classification and grouping, though it is just the start. Harper has had a pretty good start with his new team and it’s going to be interesting to see if he holds up through the rest of the season - both these Harper rookie-year cards were included as part of the 2012 Topps factory sets, so they aren't too hard to find. 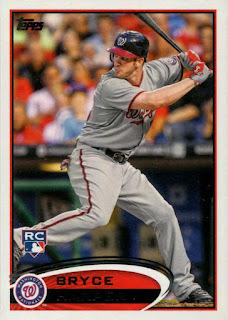 Even though the cards weren't randomly inserted in packs, due to a little FOMO - I picked up a copy of each for my micro-mini Harper personal collection. 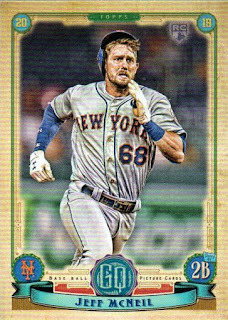 I wouldn't say pulling one is common, but I’ve seen the 'screaming variation' found enough times through $5 repack boxes that I wanted one outright - so at the very least, I don’t go fiending out trying to find my own copy of the card. 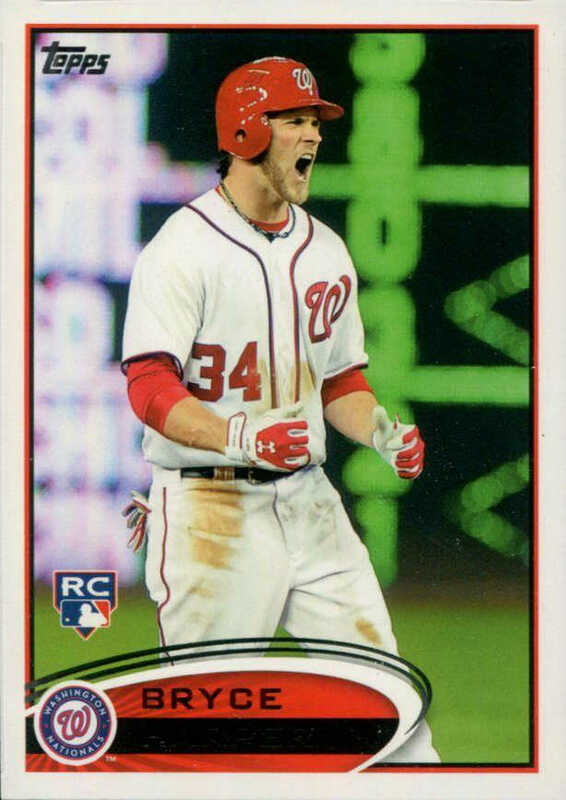 The screaming Harper is 1 of 5 factory rookie variation cards inserted as a bonus - the card to the right ['front leg up'] is the factory set variation of Harper’s super short print rookie card from 2012 Topps Series 2. Presumably the factory set variation was issued because Topps wanted traditional set collectors to have a Harper card with 2012 sets - even though it just isn't the flagship SSP Harper card coveted by serious collectors / speculators. I don't remember when I got this odd-sized card but it was probably handed out at a MLB game to honor Robinson's MLB debut - as much as I know only the player for being a pioneer for African-American integration into the major leagues, I think digging deeper makes his life experiences relevant in 21st century America. 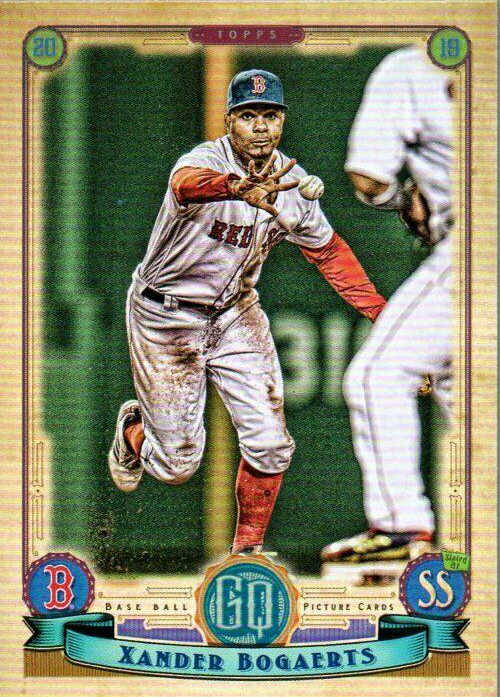 I don't know if this is really the case but I think I've been pretty 'once in a while' about random pack / blaster / box breaks over the past year or so - this just means cutting off most Target or Walmart trips made solely for cards and walking away when I've had a chance to buy a pack or blaster of something. On the other hand, I still get impulsive and maybe I was looking for some whoopee out of a random break - there are probably smarter ways to get newer cards in my collection, but things feel stale sometimes and I have to make a choice to grab something off the trading card hanger display at my big box store. #170 Lou Trivino - Mr. Mem [of Cardbarrel fame] mentioned on Twitter the card numbers printed on the back are tiny and my eyes agree. 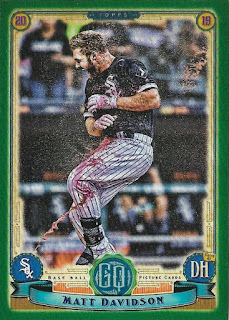 #21 Matt Davidson - I saw the base version from browsing on eBay perhaps and because of the image selected off Getty, I was happy to get a parallel of the original card. I bought a copy of this card last year, but there was a stray mark on the top left hand corner and on principle, I returned the card to the seller - even though it cost me s/h to send it back. 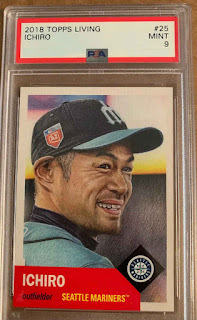 Because the impulse buy didn’t end up working last year, picking up a copy of the card ended up itch I had to scratch - Ichiro was a universally loved player and as a personal tribute to the player and the man, I wanted a cheap, classy looking 'bookend card' for my micro-mini Ichiro PC. 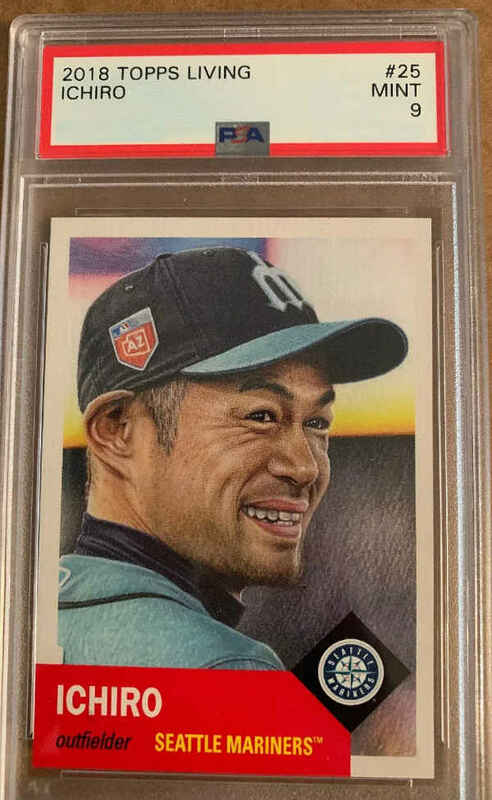 While I don’t have an extensive Ichiro card collection [maybe three or four of his cheapest rookies in addition to whatever loose cards I may have] - I do have several in-person autographs I was able get through parts of his legendary career with a few stories on those IP quests for his scribble. 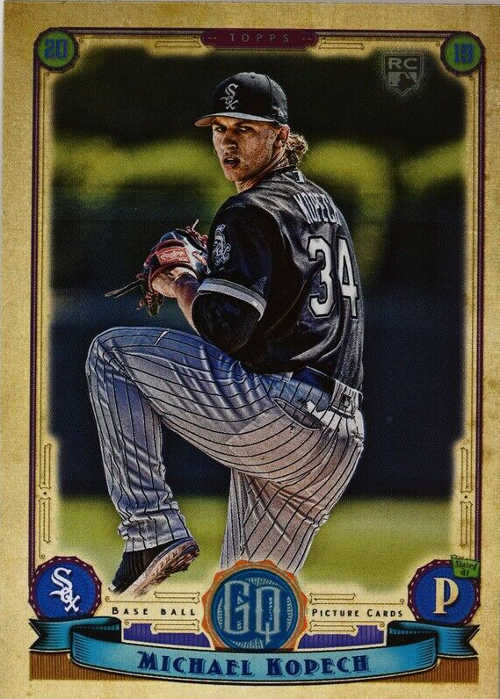 I would have originally settled for a raw copy of the card as they were released, but after the fact, a slabbed copy [$10.99 BIN - $3.00 eBay promo on purchases of $3.01 or more] only cost several dollars more - while third party grading can be a straight up joke, especially for the most recent of cards, having a card entombed in plastic gives me some peace of mind as far as getting a relatively clean card. These cards aren't hard to find at all, so PSA 10 listings are not much more than the PSA 9 ones - as far as I’m concerned a PSA 9 is what I'll usually what settle for as the most common grade for most modern cards I’m looking to pick up. Even though this old-school Sports Illustrated magazine showed Rod Carew on the Twins and not the Angels - I bought the copy on eBay to have it signed by Carew at the local card show back in 2007. I put away the magazine for good and never thought about getting Foster’s autograph until I saw he was doing these spring training autograph signings with Fergie Jenkins - in recent years, maybe Foster has been a white whale of sorts, since he has shown up where it may not have been convenient for me to go. I was able to go the Cactus League for a couple of weekends this past spring and on my last day, I saw a Facebook post by Jenkins' foundation that they were going to be signing at the Texas Rangers game in Surprise - regardless of whether I got any actual active players, one of my priorities was getting Foster. I saw the Fergie Jenkins booths as I finally got in through the left field gates after going through security / a metal detector - Jenkins’ table was between Foster on his left and Byron Browne, a former Cubs player, who I knew because he participated in a kids camp in Peoria 11 years ago. During the start of the game, I made my way to the Jenkins booth [Rollie Fingers was actually signing on the concourse, behind home plate, so it seemed like he getting most of the foot traffic] to get things over with - I looked over the price list posted on the tables [Jenkins was $30 and Browne was $20 maybe for the flat / balls] and Foster was the only one that the basic price was dependent on what you had. I dug out my magazine and asked how much it would cost to sign - hoping it wouldn't be like $30 or $40. As I handed him my magazine and my Sharpie - I gave my money to the handler next to him. Foster suggested a spot where to sign my magazine and I pointed at a different place - he signed where I wanted and shook his hand after he was done. I thought about taking a picture of him signing my item or maybe a photo op but it was nighttime and I was a little harried - to worry about anything but getting ink on my SI and leaving for a 5-hour trip back home.